Surfing is admittedly a lot of fun but also requires a lot of skill and work. If you want that same adrenaline rush but don’t really want all the hassle that comes along with it, then paddle boarding is the answer. With a paddle board, you are offered a great deal more security and support, making it a lot more fun for those who have only just started out. 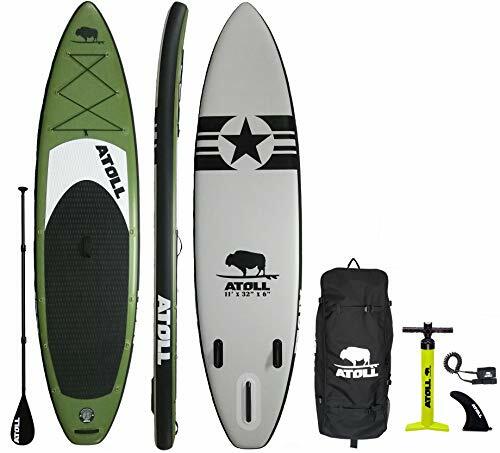 One thing that you will certainly notice and love about this Atoll inflatable paddle board is its lack of heft. It is estimated to be at least thirty percent lighter than most other paddle boards on the market. While it may seem risky to use an inflatable paddle board, Atoll assures its customers the utmost in quality. This is because this paddle board is completely wrapped with a second layer of material. This makes it more rigid as well as sturdy. The paddle board is eleven feet long and thirty two inches wide. It is perfect if you want to take another small passenger along with you. While you do have to inflate it yourself, the high pressure bravo dual action makes this a lot easier. It ensures that whether you are pushing down and pulling upwards, you are still pumping air into the paddle board. You also get plenty of other accessories, along with the board itself. You get a paddle, hand pump, removable fin, repair kit, bungee tie downs, and travel backpack. Added to all of this year, you also get a two year warranty assurance on the paddle board. The ISLE standup paddle board has been constructed out of epoxy technology. This has resulted in a board that is equal parts light as well as tough and durable. Due to the shape of the board, riders of all experience and skill level will be able to use it with ease. Even those who have only just started with paddle boarding will find it accommodating. It is also great for all types of weather because it stands up well to both flat water as well as higher waves. 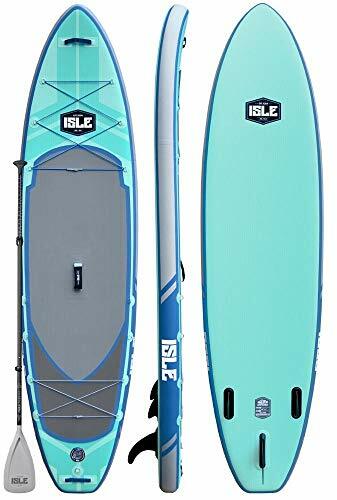 Whether you are looking for something to keep you steady or if you want a paddle board that is a little bit more versatile, this one is it. This is a package deal and for the overall cost, you get an adjustable paddle and a fin. It is also available in three different style options. You can choose from the aqua, wood, or blue design. If you are planning on moving around place to place with your board, this will not be a problem. It comes with a comfortable groove handle that makes it easy to lug this board around. The Tower paddle board needs to be inflated before it can be used. It comes with its own pump to make the task go a lot faster. Although it may be inflatable, this is an incredibly resilient paddle board. It is made from military grade PVC material and has drop stitch construction. This means that you do not have to worry about putting this paddle board through its paces. It is unlikely that you will any dings or scratches to deal with. You also really will not feel as though you are using an inflatable paddle board. This board is so rigid it will feel quite similar to a hard board. It is more than just sensation, however, when on the water, the board can take up to 350 pounds in weight. For the price that you pay, you also get a fin as well as a fiberglass paddle that can be dismantled into three pieces. The paddle has incorporated a new design that has two holds in the front. This way, you can move the paddle board around by yourself. A Viable EPS/Epoxy Board Alternative -- We're Not Kidding! 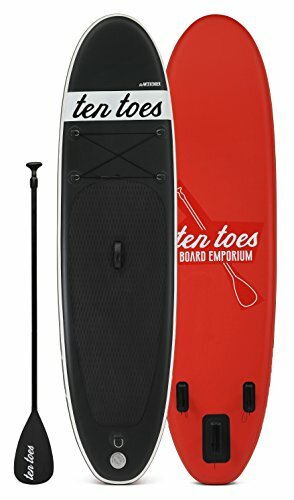 This Ten Toes Weekender paddle board revolutionizes the way that inflatable paddle boards are perceived. This is because the company has gone above and beyond to make sure that their paddle board is just as tough and strong as any hard board. This is achieved with the help of military grade PVC and drop stitch construction. You don’t have to worry about getting adventurous with your Ten Toes paddle board because it will definitely hold up. In fact, in some ways, it is actually a lot better than hardboard. This board is able to safely cruise past rocks and other things that may cause damage to hardboard. Once you have got this paddle board out onto the water, it is able to hold up about 250 pounds. Along with this really cool paddle board, you get a pump, fin, and a lightweight aluminum paddle. If all of this is not enough, Ten Toes also assures you a complete one year warranty. Also, in terms of cost, this paddle board is definitely one of the more affordable ones on the market. 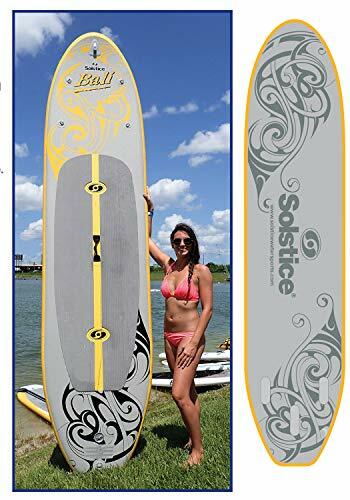 The Solstice Bali standup paddle board is the cheapest board on this list. Therefore, if you are looking for a more cost effective way to bring your paddle boarding dream to life, this is it. Despite the lower price tag, you will not feel as though are missing out on anything. This is an inflatable paddle board but is made from PVC reinforced fabric components. This means that it has been built to handle all types of riding and surfing. In addition to being strong and easily able to hold up a myriad of surfers, the Solstice board has another advantage. It is incredibly rigid and will just like a hardboard would. Despite this strength, you will be surprised to find that this paddle board is, in fact, quite light. When combined with its sleek design, it is incredibly fast out on the water. This makes it the perfect entry paddle board for someone who is just starting to dip their toes in the water. 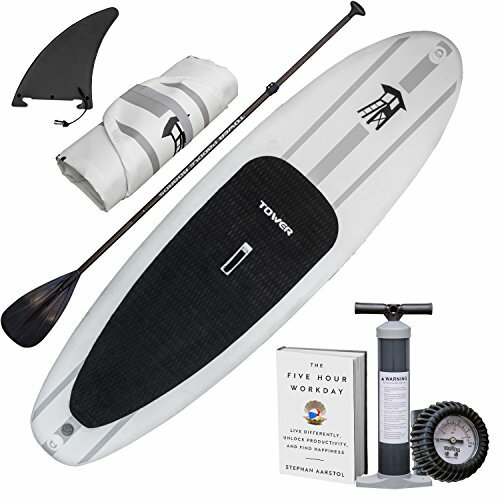 You also get a travel bag, pump, and gauge with the paddle board. Conclusion: If you are itching to get out onto the waves, there is no need to hold out any longer. Simply choose a paddle board on this list and you will take your first step into venturing forth into an adventure. You cannot go wrong with your choice.